Have you been involved in a motor vehicle collision? We are here to help! Whether you feel immediate pain or not, please book an assessment if you have been involved in a car crash. It could save you both time, money, and preserve your health. Millions of people a year are injured as a result of a car crash. Common injuries include whiplash, back pain, neck pain, or more serious head injuries. Often though, these injuries are only addressed when severe pain is felt. However, some auto accident injuries don’t exhibit themselves immediately and may worsen without you knowing. Therefore, it is very important to schedule an appointment with a qualified chiropractor who has experience treating auto accident injuries. Through his advanced training, Dr. Fish is able to carefully and gently assess any back or neck damage, no matter how small. Dr. Gene Fish has over 20 years experience rehabilitating those who have been involved in car crashes. So we understand working with attorneys and the insurance process in dealing with car crash cases. One thing important to attorneys, and your case, is documentation. We have a way of documenting your injury called the MyoVision DynaROM. This test has become the gold standard by the American Medical Association to determine the extent and location of your injury. 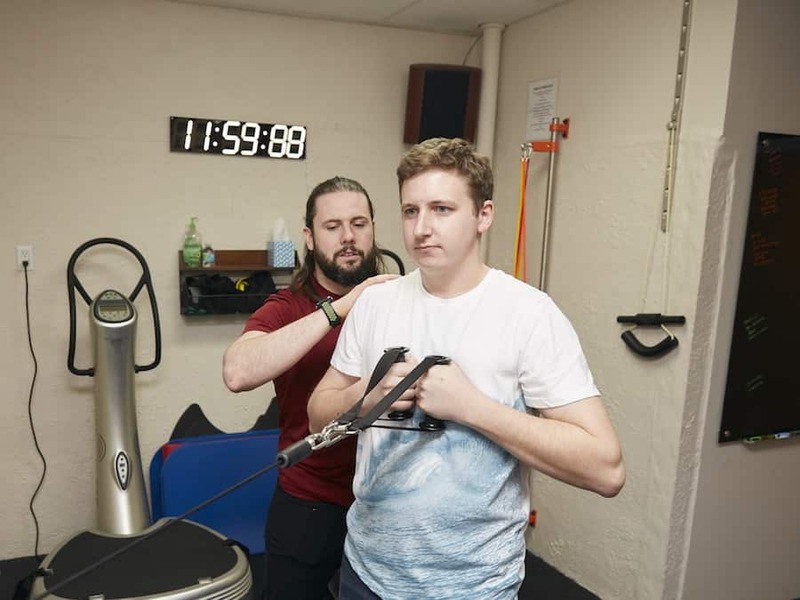 What this test does is it simultaneously measures muscle activity and Range of Motion – so we can see graphically, not only the “quality of motion” but if muscle guarding occurs. What this means for you is we are able to objectively document and measure your soft tissue injury. Please take a look through Dr. Fish’s Curriculum Vitae for more information. Here is some useful advice from Dr. Gene Fish to help deal with the aftermath of an auto accident. No matter how slight the damage. No matter whether you think you were hurt or not, call the police and file an auto accident report. You may be okay or you may not be. It may be good idea to go to the hospital after a car crash, either by ambulance or letting someone else take you. DO NOT DRIVE YOURSELF. Even if you think you were not injured or have only minor injuries from, you ought to see a doctor immediately after the auto accident. Why is that?? Because injuries that may appear relatively minor to the untrained eye can sometimes be serious. Never volunteer anything about the car crash. They may very well be working for the other side. There have been reports, right here in Horsham and Warrington, about real accident victims being asked a series of very confusing questions right after their accident. Bear in mind, they may be recording the conversation and if you are confused you may say something that you don’t mean to say. You could say something that is taken out of context and therefore could seriously hurt your case later down the line – should a problem ever arise. Even if to you your injuries appear minor, you ought to seek care immediately. A delay in care after an auto accident can cause the insurance company to believe you weren’t injured when you really were. Releasing medical information to them about your condition before or after the auto accident without consulting your lawyer is always a bad idea. I have a long-standing policy in my office not to allow records to be examined by anybody except our patient, our doctors, the patients’ attorney, or anyone that the patient directs us to release these records to in writing. Understand that sometimes people attempt to mislead or misguide someone who has just been involved in an accident and we take every step to help our patient and guide them along the path of making the right decisions and the right choices. While we do not give legal advice, we can refer you to competent, skilled, ethical, attorneys. And we will work closely with your legal adviser. Always consult a lawyer for legal advice. I was severely injured in an auto accident. My car was rear-ended and caused a pinched nerve to radiate pain down my left leg. My lower back and my L5 disc were injured so I decided to go see Dr. Fish. I have noticed major improvements and reductions in pain. With continued follow-ups, I am expecting long-lasting correction and pain relief. I had tremendous lower back pain, shoulder pain, and carpel tunnel syndrome. I was skeptical at first. So I went to occupational therapy and I went to Novacare. I was scared I would have more pain after being adjusted because I had never been to a chiropractor before. Now I get instant relief from the adjustments and I just have to keep coming back and I won’t feel stiff and sore. Chiropractic care is a long-lasting solution. I would say to people to try it, be optimistic. Come in and see him. He is very professional. My son and I were in a major car accident 3 years ago. The car hit us at 65 MPH head on. Dr. Fish came into the hospital to give us an adjustment. My whiplash almost instantly went away within 3 weeks. I recommend everyone come see Dr. Fish because he’s kind, caring, and he is down to earth and sincere. He really cares about people’s health and well-being. I would come as far as I have to because I feel I get the service that I’m looking for, and very courteous and fast-service, especially with my busy schedule they always find time to fit me in. My injury has limited me to hobbies. Shopping is a big hobby of mine right now. Bowling, swimming, you know when I feel up to it. So I will resume when my condition is better. I suffered because I was on a cane, and I was unable to do anything. I was not very active in real estate. Dr. Fish and his staff here has helped me get back my life again. I’m looking forward to getting better and even more. I suffer from back injury due to having an auto accident. So yes, I suffer from a bad back. My fears were that I would never get my life back together to be a real estate agent like I trained to be. I have come a long way since I’ve been coming to see the doctor and the staff here. The massage therapist has been very good with me getting the tension out of me and the stress because of my injury Being a mother and a grandmother, in my early 50’s I was not anxious to be on a cane for the rest of my life. So I improved tremendously. Now I am able to do a lot more. Just to get my life back and be a real estate agent. Before I had to get partner to share my responsibilities, driving and so forth, now I can do all that myself. I look forward to doing that and making more money than I am now. Chiropractic care is a long lasting correction. Therefore, I feel that maintaining is very important in that perspective. All I do is tell everyone that I am very impressed with the chiropractic service I get here. I encourage everyone that if you are feeling very badly and that you want to get your life back, definitely look into this option rather than surgery or your pills or anything like that. I have been consistently coming to Genesis for about 2 months now and I would highly recommended it to anyone! I was referred by 2 of my good friends and have had nothing but positive experiences every time I've come in for treatment. Dr. Fish and the staff there are always friendly, inviting, professional and are genuinely concerned for my well-being. I was in a bad car accident a few months back and Dr. Fish took his time to go over a detailed therapy plan which includes adjustments, muscle stimulation and physical rehabilitation. The lovely staff sends me reminders of my weekly appointments and they are super flexible at working around my schedule if something comes up last minute and I need to reschedule. The facility is new and clean and 100% professional. Therefore I Highly suggest checking them out. Discover the full extent of your car crash injuries with our corrective care chiropractor in Horsham / Warrington, PA. If you have been involved in a car crash, please schedule your free consultation with Dr. Fish; because it could save you money, time, and years of discomfort. It sometimes takes a while for the full extent of whiplash or similar injuries to be felt. Be cautious and allow us to give you a spinal and postural assessment using our modern x-rays and equipment. Using our Chiropractic BioPhysics approach, we can accurately identify any small or large problems and guide you back to health. Over time, gravity can turn even a small misalignment from a car crash into a major issue if left untreated. Pressure can be placed on your ligaments, muscles, and spine or your overall posture could be compromised. Our skilled chiropractor in Horsham PA can help repair any damage and relieve you of associated pain from your auto accident. Assisting you with injuries both acute and minor. The smallest misalignment of your back needs to be treated by a top chiropractor. Doing so will allow for fewer health problems and a faster recovery from your car crash. Caring for your spine and posture using Chiropractic BioPhysics adjustments, traction, and devices can change your life. At Genesis Chiropractic Clinic, we recommend visiting to ensure you have a healthy neck curve as a preventive measure against car accidents. So how much more do you think we want to see you if you’ve been in a collision? Dr. Fish can realign your neck and strengthen your muscles back to functional health. After an auto accident, headaches can be a sign of more extensive spinal or neck damage. Often headaches and neck pain are signs of damage to your neck tissue and your neck curve. Please use precaution and schedule an assessment with Dr. Gene Fish. Get a full assessment from our chiropractor in Horsham / Warrington, PA.